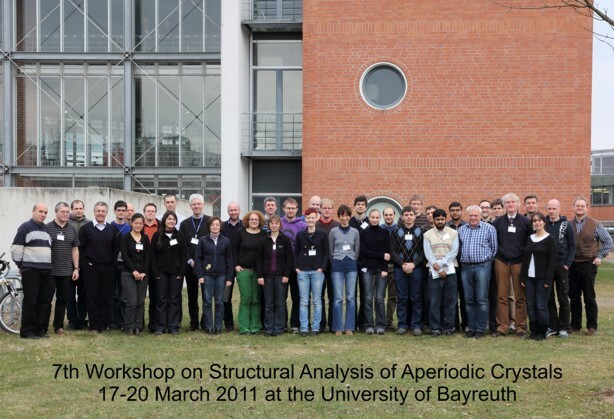 During March 17–20, 2011 the 7th Workshop on Structural Analysis of Aperiodic Crystals took place at the University of Bayreuth. This workshop was organized by Sander van Smaalen and Andreas Schönleber on behalf of the special interest group 16: Aperiodic Crystals (AK 16) of the German Crystallographic Association (DGK) and the Laboratory of Crystallography of the University of Bayreuth. Topics were the general foundations and theory of superspace and the actual methods of structure determination and crystal–chemical analysis of incommensurately modulated structures and incommensurate composite crystals. The workshop was with 32 participants very well attended. They came from Armenia (1), Austria (2), Czechia (1), Denmark (2), Estonia (1), Germany (15), Italy (4), Portugal (1), Singapore (1), Sweden (2), Switzerland (1) and the USA (1). The six speakers were Vaclav Petricek, Michal Dusek and Lukas Palatinus (Prague, Czechia), Olivier Perez (Caen, France), as well as Andreas Schönleber and Sander van Smaalen (Bayreuth, Germany). The German Crystallographic Association (DGK) is acknowledged for the generous financial support, which made it possible to carry out this workshop. The University of Bayreuth kindly put all necessary facilities like seminar rooms and computer pools at disposal. The first lectures introduced the fundamentals of the higher–dimensional superspace approach and superspace symmetry for the description of crystal structures of incommensurately modulated compounds and incommensurate composite crystals, as well as the diffraction of aperiodic crystals. In the following modern developments were presented, like the method of charge flipping for the ab initio structure solution of periodic and of aperiodic crystals from diffraction data, with which crystal structures of aperiodic crystals can be determined systematically and successfully directly in superspace, the application of the higher–dimensional superspace approach for the simplified and unified description of complex superstructures, the description of magnetic structures within the superspace approach, twinning, and the Maximum Entropy Method (MEM) to analyse atomic modulation functions. An important part of the workshop was the working of the participants on the computer. In a computer room of the University of Bayreuth they were able to practice structure refinement and structure solution with the computer programs JANA2006 (V. Petricek, M. Dusek and L. Palatinus, Prague) and SUPERFLIP (L. Palatinus and G. Chapuis, Lausanne). A script with selected examples of different level of difficulty gave a step by step introduction in these programs and into the general procedure of structure analysis of aperiodic crystals. The questions and exercises in the script served as motivation, to work out the divers aspects of structure analysis in superspace, as for example the symmetry relations between the model parameters. For the working on the computer and the exercises about the half of the workshop time was sceduled. During this time the speakers served as tutors. The participants are working in inorganic and organic solid state/structural chemistry, mineralogy and earth sciences, solid state physics, physical chemistry, materials science and engineering, biochemistry and molecular biology, and polymer and materials chemistry. This shows, that in all branches of crystallography there is a continued and unreduced interest in the topic of aperiodic crystals. Due to the positive feedback of the participants in this and in the last courses, the 8th Workshop on Structural Analysis of Aperiodic Crystals is scheduled for spring 2013.